The server looked panicked as she approached the table with menus. Before we could proceed, she gestured for us to wait a minute and then vanished. A second server soon stood in her spot. This time we had the chance to ask a question in Spanish about one of the entree items. She looked back at the kitchen and then she, too, vanished. Something we said? A third server appeared. This server, although not bilingual, seemed bemused by our attempts at her language.Mexican restaurants abound in Charlotte, but the best are located near Charlotte's ethnic enclaves and do not necessarily have a bilingual staff. Taqueria Guadalajara is this sort of place. Located in a former pizza spot near the intersection of Sugar Creek Road and North Tryon Street, this place is packed: couples, a mixed table of eight, and smaller groups of men, some of whom wear Western garb. Mexican music creates a festive atmosphere. Just inside the door are racks of Spanish language newspapers. Forest green ceramic table tops in the rustic dark wood booths have names carved around the wooden edges. The kitchen crew, seen through brick arches, pulses. Images of Mexico hang on the walls: black and white photographs of folk heroes such as Pancho Villa and Emiliano Zapata. The photo of the woman who looks like Jane Russell on the back wall is one of Pancho Villa's 22 wives. 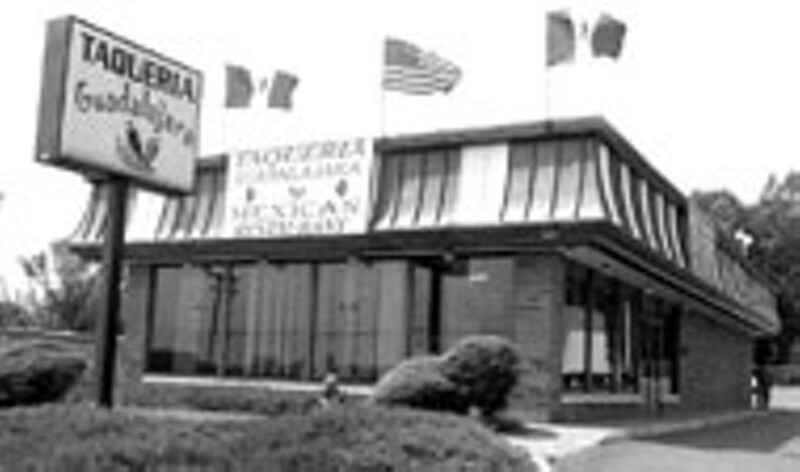 Taqueria Guadalajara celebrated its third anniversary this month. Owners Renardo Raso and Jose Herrera opened in the hopes of serving the Spanish speaking community. Says Herrera, "This food is 100 percent Mexican, not the Tex Mex found in some of the "Mexican' restaurants here (in Charlotte). Our dishes are from Guadalajara, especially the tacos. That's why our name is Taqueria." Herrera reports that 80 percent of his customer base is Spanish speaking Latino. The menu, however, is in both Spanish and English but is devoid of ingredient descriptions and cooking methods. Once a server had a permanent position at our table, chips, a bowl of quartered limes, and a trio of salsas quickly appeared. Munching on these, we perused the menu. A modest selection of Mexican beers and domestic sell for the same price, $2.50 but -- no margaritas nor tequila. The menu has the usual roundup of classic, casual Mexican offerings, plus the weekend specials of menudo and serviche. Beef soup is the special on Monday and Tuesday, and Shrimp Soup on Thursday and Friday. Soft taco fillings range from pork, steak, and chicken to chitterlings, beef tongue, and beef head. These ingredients also turn up as choices in burritos and quesadillas. A hero-sized barbacoa (or Mexican barbecue) sandwich ($5) shone with tender strips of well-cooked, seasoned beef, showered with strips of crisp iceberg lettuce, and slices of avocado and jalapenos. The same beef showed up again on the steak fajita ($8.50), here mixed with slices of bell peppers, onions, and tomatoes. Although the picture on the menu shows fajitas served from skillet, ours was brought to the table on a plastic plate accompanied with rice, refried beans, and a chopped iceberg lettuce salad. Also good is the Al Pastor taco, the house signature dish, with strips of tender, marinated grilled pork and a fine rendering of familiar fare. On the other hand, the deep fried godornices, Cornish hen, tasted flat and dry. Unfortunately, the delicate meat was bludgeoned by the cooking method. Quail is also offered. "Quail hunting is a popular hobby in Guadalajara," Herrera says. You cannot go wrong with their housemade desserts ($2.50). The Flan de Leche is pleasing and smooth, while the Pan de Queso (cheescake) is light, yet velvety. Taqueria Guadalajara does not serve the American hybridized, co-opted Mexican fare we are increasingly offered in Mexican restaurants. Their food is simple, inexpensive, and refreshingly good. Harris Teeter raised $160,000 for Operation Phone Home through donations by their customers. 22,500 phone cards are being given to servicemen and women stationed throughout the Middle East and in military hospitals in Europe. The Neighborhood Farmers' Market, located on the northwest campus of the Mecklenburg County Health Department, 2845 Beatties Ford Road, will be open from 8am until 3pm every Saturday until October. The market is part of the MCHD's program to increase healthy food choices among low-income families who may live in areas not served by grocery stores. Among the items on the new spring menu at Patou, 2400 Park Road, is asparagus and morel mushrooms with puff pastry and an orange demi glaze; blackened quail over mesclun greens with grapes, walnuts, and a wine vinaigrette; sauteed skate wing with almonds, brown butter lemon juice, and capers; and a rack of mustard and parsley crusted lamb with mashed potatoes and spring vegetables. 704-376-2233. To open in June in Latta Pavilion, 1315 East Boulevard, is Red Star Tavern, part of the Chicago-based Restaurant Development Group which owns 34 restaurants nationwide. Red Star will offer "homestyle classics" such as spit roasted half chicken with mashed potatoes ($11.95); baby back ribs with coleslaw and fries (half slab $10.95), blue cheese crusted filet with mashed potatoes ($21.95), burgers, salads and "kid friendly selections." Call 704-333-3393. Stefan Latorre will open an upscale restaurant and nightclub this October next to his Latorre's Restaurant on West Fifth Street. The 10,756 square foot building was built in 1910 and Latorre plans to spend $750,000 on renovations. The nightclub will operate on three floors and have an outside patio. Each floor will have different themes and dance music. A name has not been selected at this time. Copper River salmon is once again on the menu at Palomino Restaurant Rotisseria Bar, 525 N. Tryon Street. Also they have live music on the patio from 6:30pm until 9:30pm Fridays. Mojitos are also the special every Friday. 704-373-9669. Arlene Degges is the new manager at Mama Ricotta's.